By any measure, the Royal Navy has had a rough week. In the span of three days, the Brits cut their flagship carrier, the Ark Royal, reduced their fleet to its smallest size in centuries and, now, has run its nearly $5.5 billion nuclear submarine Astute into the mud near Scotland’s Isle of Skye. A British nuclear submarine ran aground off a Scottish island on Oct. 22, the defense ministry said, adding that there were no immediate signs of any casualties or environmental damage. HMS Astute – which only entered service in August and is billed as the Royal Navy’s most powerful hunter-killer submarine – got into trouble near the Isle of Skye. A Ministry of Defence spokesman said that the rudder of the 3.5-billion-pound (3.94-billion euro, $5.5 billion) submarine had become “grounded”. “Whilst conducting a personnel transfer HMS Astute grounded her rudder in the vicinity of the Isle of Skye. She was initially unable to free herself and we are waiting for the next high tide,” the spokesman told AFP. 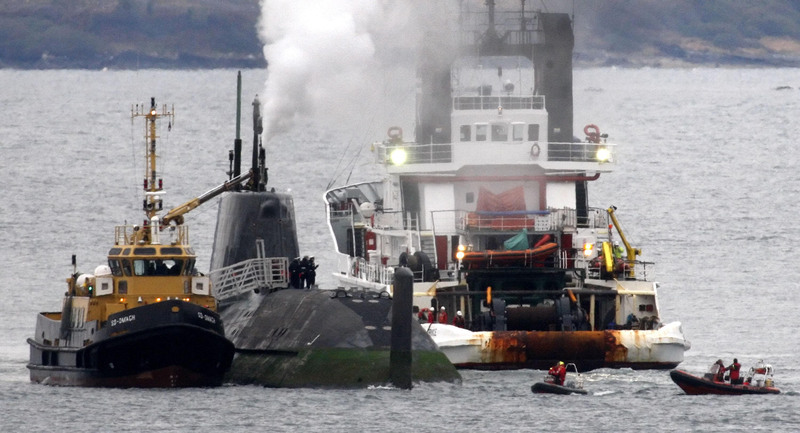 This isn’t the first time a British sub has run aground near Skye. In 2002, the HMS Trafalgar ran aground resulting in $9 million of damage. In that short movie, Astute is exhausting her emergency eletrical generator system I am guessing. What does it mean when a diesel engine constantly emits white colored smoke exhaust ? Is that normal ?